Romacorp, Inc., the parent company of Tony Roma’s®, is introducing a limited time menu, featuring six new items, each offering a classic flavor with an innovative twist. Available at participating locations from February 26 – April 28, the special menu features dishes including Crispy Buffalo-Style Cauliflower, Harissa Glazed Grilled Salmon and Sweet Heat Chocolate Cherry Cake. Crispy Buffalo-Style Cauliflower – Cauliflower florets dusted in Kickin’ flour and corn meal lightly tossed in buffalo wing sauce; served with bleu cheese dressing, carrots and celery. Filet Medallions & Grilled Shrimp – Grilled medallions topped with Steak Diane sauce paired with grilled shrimp and a three-citrus butter sauce; served with mashed potatoes and seared garlic green beans. Harissa Glazed Salmon – Grilled salmon with a glaze of maple syrup, harissa and touch of lime; served with mashed potatoes and seared garlic green beans. Sweet Heat Chocolate Cherry Cake – A chocolate cherry cake with a kick; served with basil whipped cream and vanilla ice cream. Spiced Pineapple Romarita®– Sauza Gold tequila, Cointreau, pineapple juice; served with a spiced rim. Chambord Manhattan – Knob Creek bourbon, Chambord raspberry liqueur, lemon juice, simple syrup. Romacorp, Inc., is the parent company of Tony Roma’s restaurants, the world’s largest casual dining concept specializing in ribs. Headquartered in Orlando, Florida, Romacorp, Inc. has more than 135 restaurant locations in more than 25 countries and is one of the most globally recognizable names in the industry. The first Tony Roma’s restaurant opened 46 years ago in North Miami, Florida. For more information about Romacorp, Inc. and Tony Roma’s, visit http://www.tonyromas.com. 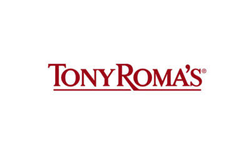 Please visit http://www.tonyromasfranchise.com or call (866) 628-1694 for information about Tony Roma’s franchising opportunities.